Zinga A Fraser is the co-chair of Columbia’s IRAAS Alumni Council and has a PhD in African American Studies. She is an active supporter of Columbia University’s African American and African Diaspora Studies Department. This new department will bring a fresh approach to the discipline at a crucial moment in race relations and black identity within our society. Currently Fraser teaches at Brooklyn College. Monday, January 21, 2019 at 8pm, CUNY TV will be broadcasting our Conversation with Sonia Sanchez! If you didn’t get to join us for Chisholm Day, please tune in tonight! In her dialogue with Chisholm Project Director Zinga A. Fraser, PhD, Dr. Sanchez spoke about Chisholm’s legacy, and also her own work as an activist and poet, against the backdrop of the Black Freedom Movement. Online: http://www.cuny.tv/show/cunytv/PR2008177 DIGITAL Ch. ALSO: 25.3, and cablecast in the five boroughs of New York City on Ch. 75 (Time Warner and Cablevision Brooklyn), Ch. 77 (RCN Cable), and Ch. 30 (Verizon FiOS). You don’t want to miss it!!! Please contact us so we can provide more information about being interviewed and/or donating memorabilia to the project. You may do so by making a tax-deductible contribution to the Brooklyn College Foundation. Go to: The Brooklyn College Foundation Website. Complete the online donation form. Please make all checks payable to The Brooklyn College Foundation. Zinga Fraser, PhD returns to @AM2DM on BuzzFeed News to discuss Shirley Chisholm entrance in the United States Congress and parts of her political career. Over 401K viewers see the interview between Professor Fraser and Isaac Fitzgerald. She didn’t let the institutional power her campaign faced rattle her, said Zinga Fraser, professor and director of the Shirley Chisholm Project on women and activism at Brooklyn College. 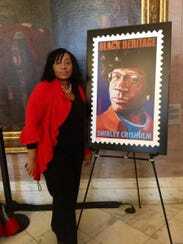 The Shirley Chisholm Project and it’s upcoming Chisholm Day celebration were also recently mentioned in a piece in The New York Amsterdam News. Professor Zinga A. Fraser featured along with Rep. Yvette Clark, Senator Kamala Harris, Rep. Maxine Waters and several others on the importance of Shirley Chisholm. WASHINGTON — The American Association of University Women (AAUW) awarded a 2017–18 AAUW American Fellowship to Dr. Zinga Fraser. She is an Assistant Professor in Africana Studies and Women’s and Gender Studies at Brooklyn College. American Fellowships, AAUW’s largest funding program, date back to 1888, making them one of the oldest and most prestigious fellowship programs in the world exclusively for women. AAUW American Fellowships support women scholars who are completing doctoral dissertations, conducting postdoctoral research, or finishing research for publication. “As an AAUW American Fellow I will be researching and working on my book manuscript entitled, Sister Insider/ Sister Outsider: Shirley Chisholm and Barbara Jordan, Black Women’s Politics in the Post Civil Rights Era.” Fraser said. “I am honored to receive this prestigious fellowship that will allow me to complete this most important and timely work on Black women’s politics. This work hopes to transform not only how we understand the political lives of Congresswomen Shirley Chisholm and Barbara Jordan but also understand the ways in which Black women help us reimagine democracy in the U.S. ” she continued. This book will be the first comparative study of Black Congressional women. 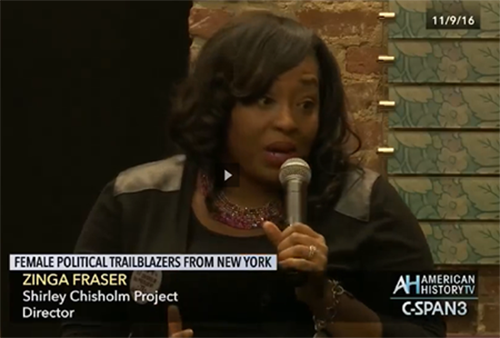 Dr. Fraser is the Director of the Shirley Chisholm Project on Brooklyn Women’s Activism at Brooklyn College. Professor Fraser‘s work focuses on African American and Women’s Politics, Black Women’s History, U.S. social movements and Race and inequality. She has published works in Souls: A Critical Journal of Black Politics, Culture and Society, the Association of Black Women’s Historians and Phillis: A Journal of African American Women’s History. As a former Congressional staffer on Capitol Hill her work engages the efforts by Black political leadership and African American communities to address institutional inequalities within public policy. Prof. Fraser received her B.A. from Temple University; M.A. from Columbia University; and Ph.D. in African American Studies from Northwestern University. For the 2017–18 academic year AAUW awarded a total of $3.7 million through six fellowships and grants programs to 250 scholars, research projects, and programs promoting education and equity for women and girls. AAUW is one of the world’s leading supporters of graduate women’s education, having awarded more than $100 million in fellowships, grants, and awards to 12,000 women from more than 140 countries since 1888. The American Association of University Women (AAUW) empowers women and girls through advocacy, education, philanthropy, and research. Our nonpartisan, nonprofit organization has more than 170,000 members and supporters across the United States, as well as 1,000 local branches and more than 800 college and university members. Since AAUW’s founding in 1881, our members have examined and taken positions on the fundamental issues of the day — educational, social, economic, and political. Learn more atand join us at www.aauw.org. Tracie Strahan sits down with Zinga A. Fraser, PhD the director of the Shirley Chisholm Project at Brooklyn College, to discuss Chisholm’s legacy and how the project honors her. You can go to www.chisholmproject.com for more information. © 2016 NBCUniversal Media, LLC. All rights reserved.